Welcome Pinners! Make sure to check out all our healthy farm recipes here. 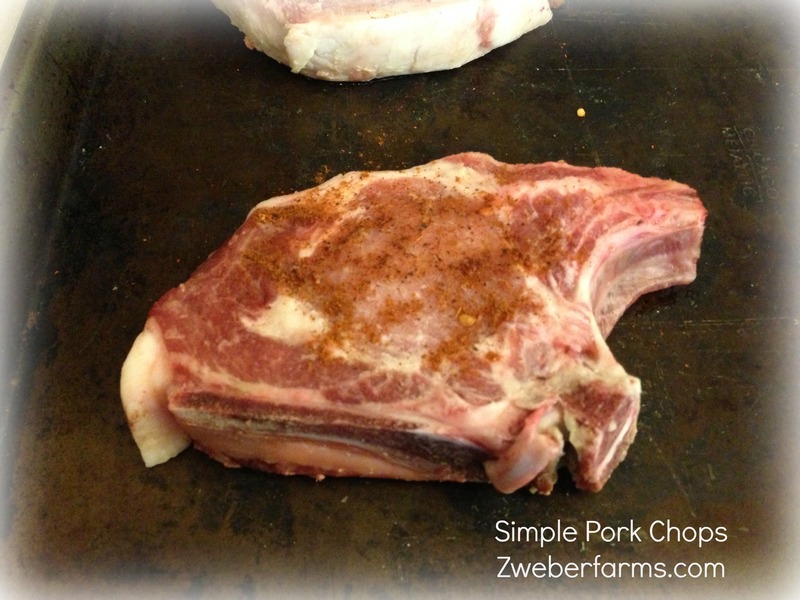 You really can have a great tasting simple oven baked pork chop, using bone-in chops (or now called ribeye chop), meal in less than 30 minutes. Sometimes I am all about the simple. 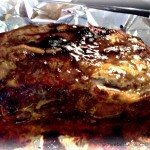 Remember my simple juicy pork roast recipe? When you start with great tasting pork, like ours, just a few spices and you are set. Preheat your oven to 350 degrees. Sprinkle a little bit of spices on both sides of your chops. (note: there will be extra Cajun seasoning. Please don’t use it all on a few chops. It will be too salty). Arrange them on a baking sheet. Bake for 20-30 minutes flipping them half way. When nearing the end of the baking time use a meat thermometer to check for doneness. 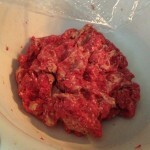 A done chop is at 145 degrees. While these simple oven baked pork chops were baking, I heated up some sweetcorn we froze last summer. I also cooked some whole wheat pasta and served it with butter and dried parsley. Don’t forget your tall glass of Organic Valley milk! If you are interested in ordering our farm fresh pork, please call (952-461-3428) ASAP to get on our waiting list. Our first pork packages will be available the end of September. We sell out early each year, so don’t delay. You can see what is included in a pork package here. Our prices are listed here. Zweber Farms is a fourth generation organic farm located in Elko, MN. We raise dairy, beef, pork, chickens and eggs. Connect with us on Facebook, Twitter, Youtube and Google+ . Make sure to sign up for our bi-weekly e-newsletter here. Preheat your oven to 350 degrees. 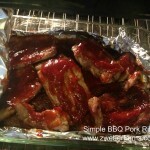 Sprinkle a little bit of salt, pepper and spices on both sides of your chops. Arrange them on a baking sheet. I tried the first pork chop recipe, too salty. I combined 2 recipes, yours and another that calls for an Italian season bread crumb crust fried till crispy then baked. My fiancé loved them!!!! 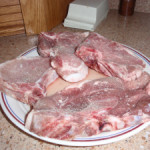 The bone in pork chops are far more tender than boneless. I preheat oven to 375%, place chops in Pam sprayed pan, rub chops w/ tsp olive oil or melted butter. In small bowl, mix all seasons, salt, pepper, garlic, onion powder, tiny bit of oregano & Basil, Mix well, rub on both sides of chops. Bake 25-30 minutes, remove from oven, allow to sit for 10 minutes, serve w/ veg, of choice, potatoes & never forget the apple sauce. Delicious! Thank you Mrs H! I am loving your side dishes! Thank you! Quick and easy and came out great! I’m a single guy and made these tonight along with mac n cheese and a salad. I really liked the rub, it had a very unique and great flavor that I haven’t experienced before. Thanks! Thanks Dustin! I am glade you liked them. Your recipe came to the rescue tonight. I worked late and had plan on doing the chops on the grill, however, when I got home it began to rain. I “googled” oven baked pork chops and your recipe appeared. THANK YOU the meal was a big hit. Have a fantastic week. I found this recipe tonight on a Google search. It was DELICIOUS! 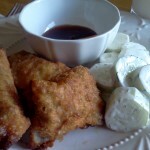 My husband must have commented four times during the meal how much he liked it and that we should make it again. I did cut back the cayenne to just a teaspoon because I thought it might be too much hear for our three year old but it was still great. Thanks! So glad you enjoyed it Ann! Very good..I substituted the pork with kangaroo chops. Really? How are those? Are they similar in taste and texture? I love kangaroo, it’s very lean and tasty – but very difficult to find stateside. The texture is similar, but it tastes like kangaroo… And I love this recipe for pork chops – thank you! This recipe is fantastic! It’s simple enough to pull off within an hour, yet as tasty as my dad’s chops that can take all day it seems to marinate! Thank you! Making these right now! 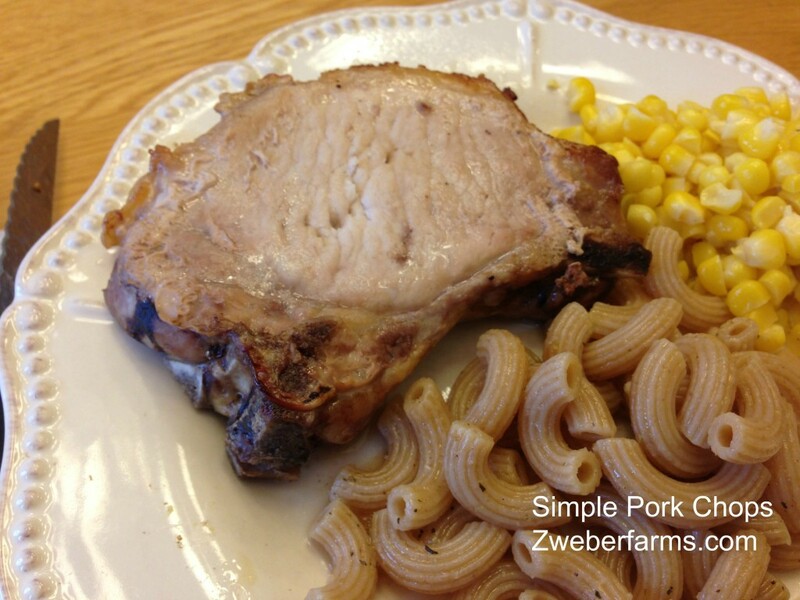 Was excited to find this easy pork chop recipe and it is a bonus that you are Organic Valley farmers! My sister and brother-in-law are also! Awesome! Who are your sister and brother-in-law? OV is a tight community!! Do these work on simple pork chops with no bone? I used this recipe as a guide (like I do with most), and it turned out the Pork Rub I used had very similar ingredients as this recipe uses. I used thick boneless chops and they turned out great. I marinated them for a 4 hours with a little Maggi and the Pork Rub. i was unable to get the oven to 350 degrees. this recipe is crap. Tried this recipe last night pork chops very tender and just enough seasoning! Will use this again glad I found it! I tried it but I made a horseradish caper sauce with a side potato salad with bleu cheese and crumpled bacon .if you like the heat this should do it wow I will go to sleep now. Making this tonight with Organic Prairies pork chops and of course a tall glass of organic valleys milk and a local OV farmers green beans! Was searching for a recipe and I am going with your because you are one of our farmers. Thank you for all that you do! You’re recipe came to the rescue for me also. It was delicious and very moist. Best we have tasted in a long time! Thank you. shawty these porkchopz is on point! I tried this recipe and it DELICIOUS!!!!!!! !….My family loved them. THANK YOU FOR SHARING YOUR FAMILY’S RECIPE……AWESOME!!!!!!!! I prepared this recipe tonight with a couple of changes, not on purpose. I substituted chili powder (ran out of cayenne) and I didn’t have any black pepper ground, so I ground it directly on the chops. I bake chops often and we love them! This Cajun seasoning made the best chops ever! Thank you!